So, what did you mix today? 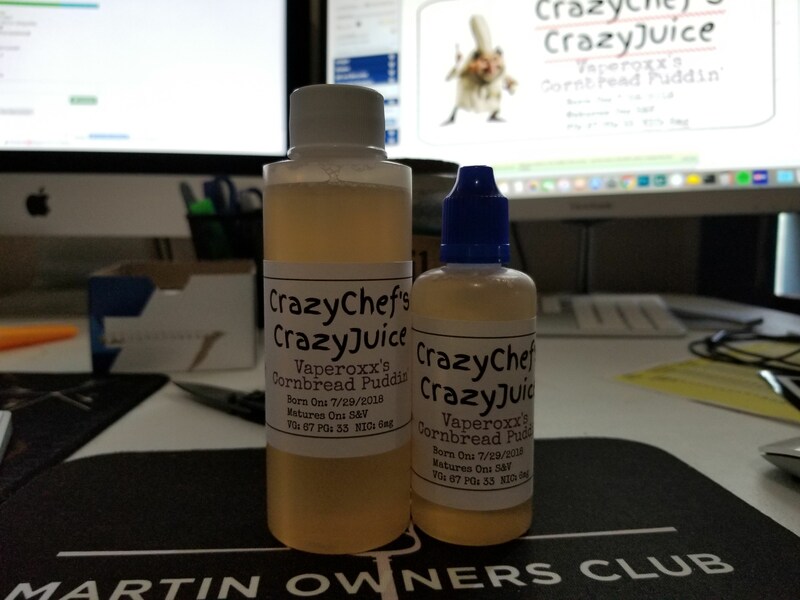 Mixed up a 60ml batch of Vaperoxx's Cornbread Puddin', as well as a 120ml backup. This stuff is absolutely delicious! The recipe calls for a whopping 33% flavor, but believe me - it is NOT overly strong. I'd say it's about the strength of most other juices in the 12-15% range. Click the link for the recipe. Mixed up some Cromwell Custard and a couple testers of lemon custard and coconut custard. After re-reading my post, those four ingredients together might not be too bad. Chocolate mascarpone cheesecake with a shortbread crust! Okay, it's a go - here are the percentages I think will work. Obviously, I've never tried any of these yet, so let me know your thoughts.